Synchronize Contacts, Calendars, Tasks, Meetings, Calls, and Todo's between Act! and Outlook with the simple click of the mouse. The safest, quickest, and smartest way to keep your Act! and Outlook Synchronized! Do you want to exclude your private contacts and/or activities from being synchronized with the central Exchange company directory? 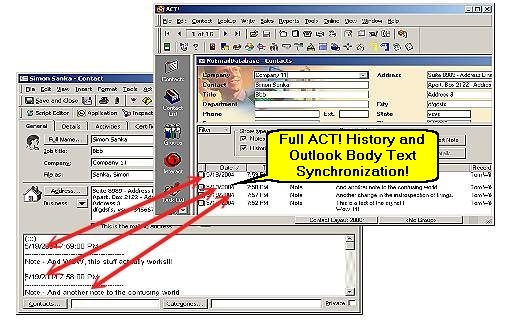 ACT-Outlook Synchronizer allows you to exclude private contacts from Act! to be brought over. In addition, you can also exclude any activity that is private from cluttering the company calendar folder. Enhanced contact and activity tagging eliminates duplicates even when the folders are moved. Improved speed on bringing new items back from Outlook. Activity Tagging: Automatically add additional contact information to the Activity subject line in Outlook for ease to use on your PDA! Select individual contacts, groups or even lookups to be synchronized. Selectively decide which contacts to merge via natural Act! procedures. Background Manager. Setup regular syncs using the new background Manager. Outlook Clean. 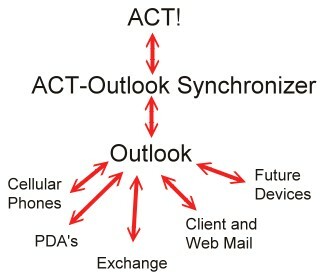 Clean your Outlook Contacts and Activities and reset the ACT-Outlook Synchronizer indexes with the click of a button. Manage and integrate with Act! Multi-user databases. Synchronize with Local Outlook or Exchange folders. Full Act! 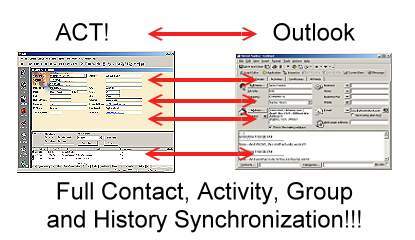 Groups to Outlook Categories Synchronization! Close integration with Outlook with No Outlook Security Warnings during the synchronization operation. You don't need to keep on clicking every 10 minutes to allow the software to access your Outlook or Exchange folders. Unparalleled integration with the Act! toolbar and options. You can choose a multiple set of operations that you most frequently perform and position them in the Act! Contact Toolbar as icons. Map any field in Act! into any field in Outlook. If the field in Outlook does not exist, ACT-Outlook Synchronizer will create that field for you. No more lost data in unmatched fields! Outstanding Synchronization options where you can start with non-deletion synchronization to full, equalized synchronization with addition and removal of contacts and activities. Remove a contact in Act! and it gets removed in Outlook or vice versa. A full synchronization product. Outstanding Outlook and Exchange support via automatic mounting of default folders or user assignable folders. Outlook specific tools to clean your outlook folder with the click of the mouse. Our advanced one-to-one matcher ensures that your databases is not populated with duplicate contacts or activities. A modification in one Item in Act! or Outlook is consequently reflected in Outlook. Have your activities tagged with contact specific information so that when you look at the Outlook Calendar, you know exactly with whom the activity is scheduled with and with the phone number listed. You can synchronize with the click of a button, run the synchronization in the background or schedule regular interval synchronizations using the Windows Scheduler. Our unmatched capabilities and speed make this product a breeze to work with. Last but not least, outstanding Online Help that keeps users updated with the latest improvements to the software but also with Local Windows Topic Help and a fully printable manual available in Adobe .pdf format.